1. SWBAT explain what a tide pool is. 2. 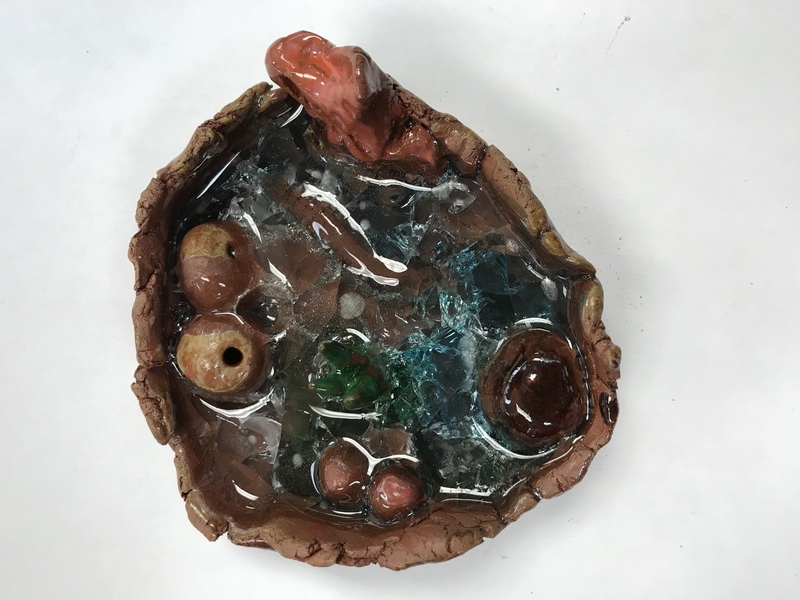 SWBAT create a ceramic pinch pot. 3. SWBAT sculpt miniature marine life. 4. SWBAT create a variety of textures in clay. 5. SWBAT understand the ceramic process from plastic clay to finished glazed pieces. -discuss tide pools. Do any students know what they are? Explain and show pictures, pointing out the variety of plants and animals found in them. -apply dark brown or black glaze to outer “rock” portion of pinch pot by dabbing on and wiping off so that it stays in crevices but is mostly removed from smooth surfaces. This will emphasize the texture to create a rock effect. -fill in tide pools with glass before firing, which will melt in the kiln. Meeting glass in ceramics is definitely not food safe. It can occasionally cause cycles to form at the surface. Programming your kiln to hold for 10 minutes or so at temperature can give the bubbles time to level off. Inspect projects as they come out of the kiln and file down any remaining surface bubbles so there are no sharp edges. I did this project with 2nd grade and they did ok but it would probably turn out even better with older students.